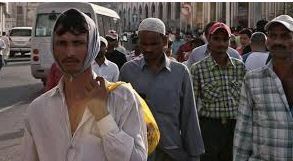 STORY: More than 200 migrant workers in northern India’s Amritsar city on Monday (April 8) requested authorities to provide them alternative voting methods. The migrant workers, who come from different states in search of better opportunities, are devoid of the opportunity to cast their votes as they find it difficult to travel back and forth from their villages. The workers, most of whom earn daily wages, say that they would have to lose their earnings on the voting day in order to travel and vote. “We should get a right to vote from anywhere”, said one of the migrant workers, Mahesh Varma, he added. Although there is a law that allows a voter to register from any constituency but most migrant workers, who are poor and not very educated, are unaware about it or don’t bother to get registered under a new constituency.